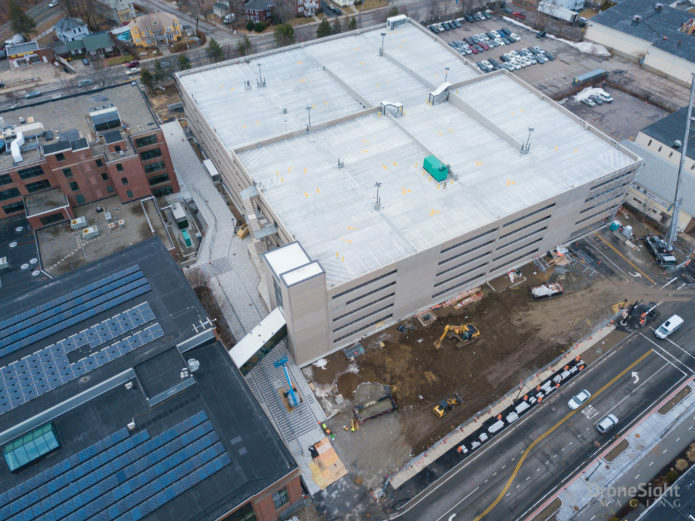 It is the depths of winter and the new parking garage on campus is finally open. As of February 2018, the Arsenal on the Charles now has two active parking garages, relieving some well-known parking challenges. The construction of the project started back in October 2016, hot on the approval from the Watertown Planning Board. The team worked through the 16 month duration and moved 120,000 tons of soil, placed 12,000 yards of poured concrete, lifted 979 pieces of precast concrete and worked over 150,000 hours on the construction site. With the structure and building finished this winter, the site will be finished in the spring of 2018. We won’t be totally finished until the completion of the pocket park to the south of the garage, boardwalk through to North Beacon Street and Charles River Road intersection, and west driveway connection from Arsenal Street to North Beacon Street. Through the winter and into the spring, will be working on the installation of garage screening, addition of greenery around the walls, and external decorative staircase. With these projects behind us, the majority of the project, phase 1, the garage itself, will be complete. 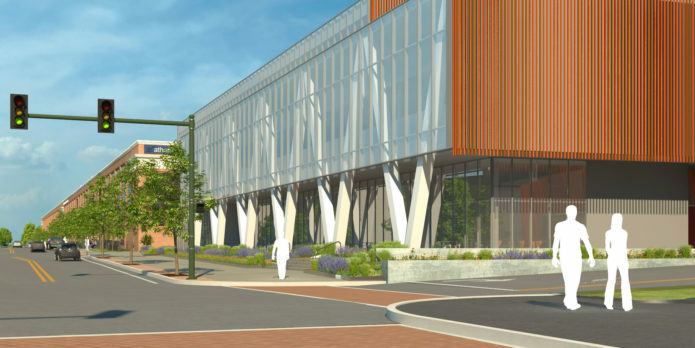 When visiting the campus, the east garage, near the BSC, Pedro’s, Panera, Branchline and employees on the east of the campus will be the one to provide parking for you, the new garage is placed to provide parking for employees on the west side of campus. Thank you for your patience during this construction, we’re thrilled it’s now open. Later this year the campus will see the construction of building #2 start, sited on the north side of the new garage facing Arsenal Street. The project is projected to start in Q4 of 2018, with intended completion by the end of 2019. Building #2 is designed as a 30,000 sf, 3 story building adjoining the new garage structure.